Special occasions happen year-round, and no pup's wardrobe is complete without a fancy dress collar!.. Our Combination Metal & Plastic buckles mix the beauty and strength of polished metal with the light.. The dazzling collar collection is reminiscent of the classic boucle suit with a touch of bling. We t..
Dakota Rose is a vintage inspired design that captures the spirit of the prairies and pioneers of th.. 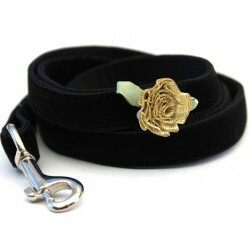 The Dori dog collar is fresh, like a summer breeze in the country. Dori's hand embroidered flower is..
Because fabulousness shouldn't be left only for walks, these beaded collars are the staple accessory.. Jewel Collection: Made with finest quality crystal acrylic beads on a stainless steel cable, Aqua Je.. Jewel Collection: Made with finest quality crystal acrylic beads on a stainless steel cable, Emerald..